Overview of the roles of HIF-1α and HIF-2α in myeloid cells. Both HIF-1α and HIF-2α are required for key macrophage functions, such as cytokine production and the ability to migrate and invade. However, macrophage glycolysis, ATP generation, and bactericidal activity have been related to HIF-1α exclusively. Nevertheless, both isoforms contribute to pathogenesis of various acute inflammatory syndromes. Additionally, the roles of myeloid HIF-αs in the setting of tumor inflammation are currently being investigated. As compared with macrophages, less is known about HIF-αs in neutrophils. However, it is very clear that both isoforms are required to inhibit neutrophil apoptosis and elongate their lifespan. 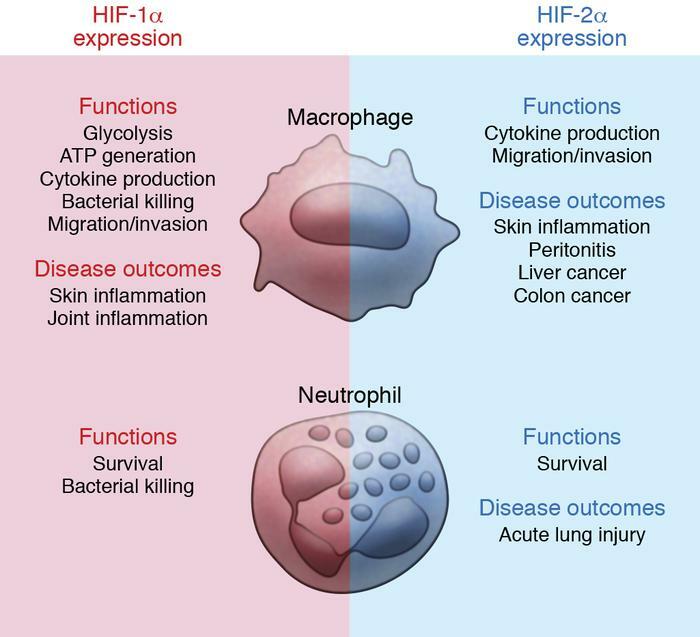 While HIF-1α facilitates bacterial killing by neutrophils, many neutrophil functions seem less dependent on HIF-2α, including respiratory burst, chemotaxis, and phagocytosis. Nevertheless, increased neutrophil HIF-2α accumulation correlates with increased neutrophilic inflammation and lung injury in an LPS-induced acute lung injury murine model.